Feel the Love ~ Make Your Offer! 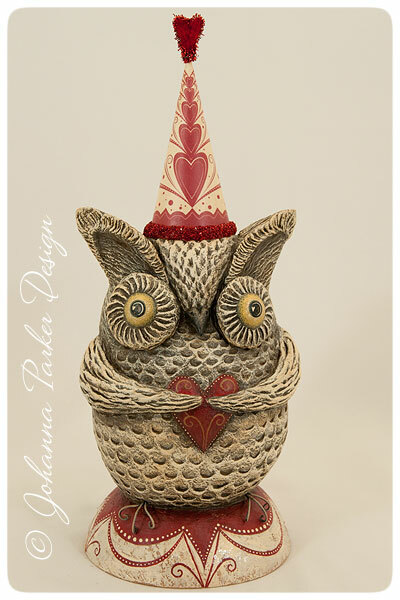 The month of LOVE is upon us, and I am here to tempt you with this charming owl who may just steal your heart! 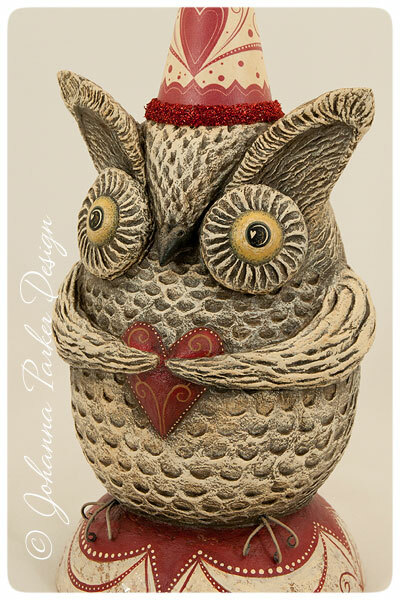 "Romantic Romeowl" a light-hearted twist on Romeo, stands 9.5" tall. 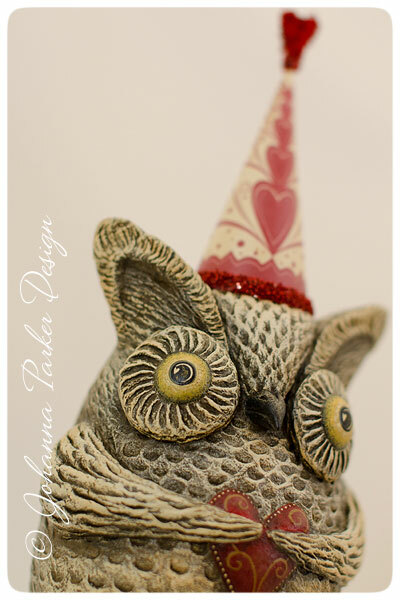 Quite the darling of Valentines, he is hand-sculpted and hand-painted by me, Johanna Parker. 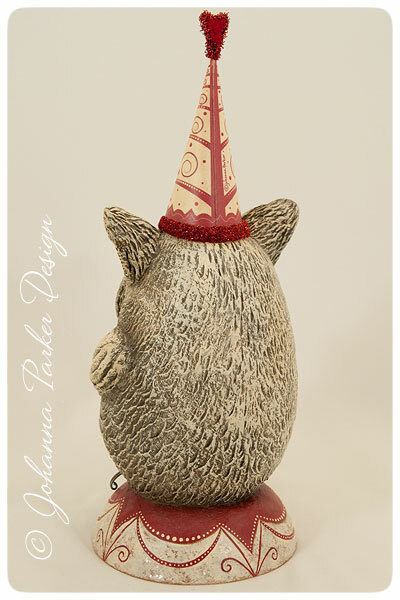 He dons a handmade illustrated hat of hearts, trimmed in red glass glitter and a chenille heart tip. 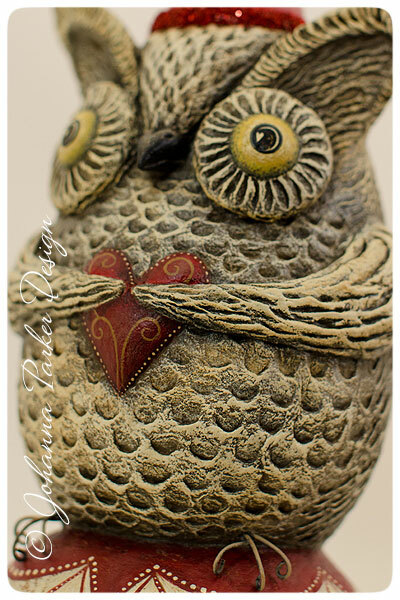 And as much as I LOVE him, this admirable owl is up for bids! Does your heart go pitter-patter when you look into his eyes? 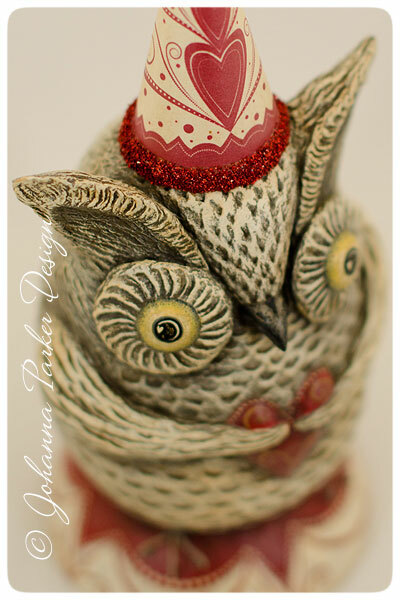 Perhaps a hint to your honey will be all you need to make Romeowl your Valentine. 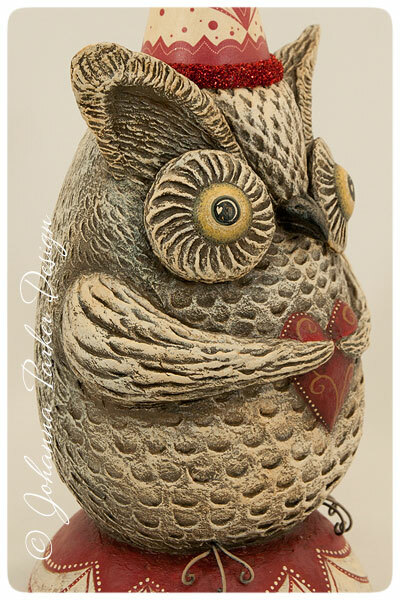 Or, maybe it's time to indulge in your passion for owls or your desire for one of a kind folk art. Whatever the reason may be, treat yourself to this sweet fellow by placing your Best Offer! 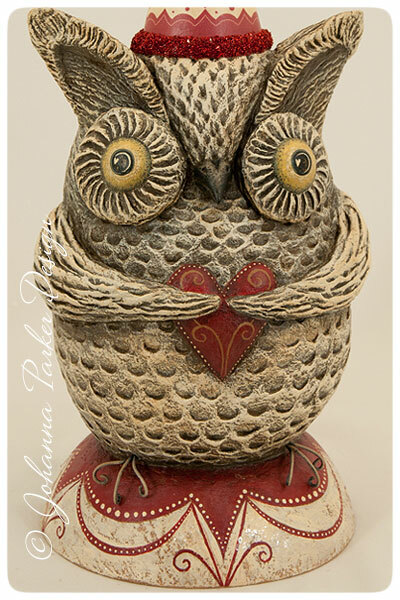 Many thanks to all of my generous collectors who placed bids of affection for Romantic Romeowl! I am so very grateful to you. 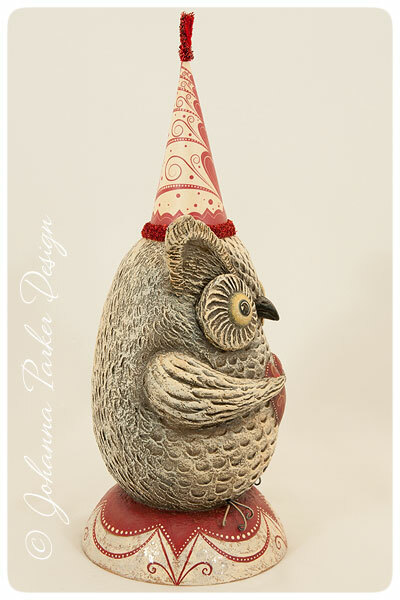 Romeowl will soon be taking up residence with Amber in CA, an I feel he is excited to meet her. 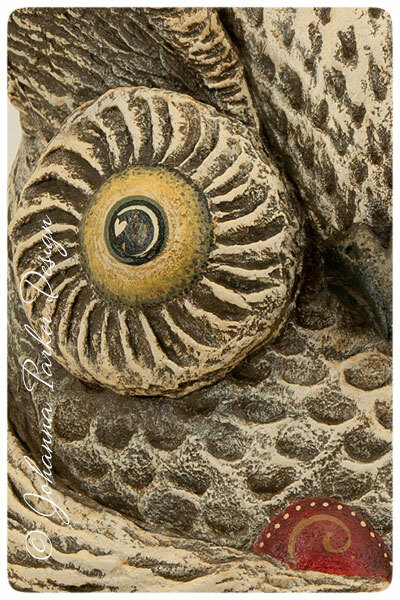 :) Thank you ALL so very much for your support and LOVE for my one of a kind folk art! As a special gift, I am sharing my Valentine Hearty Hat template for you to print and play with! Click HERE and enjoy! 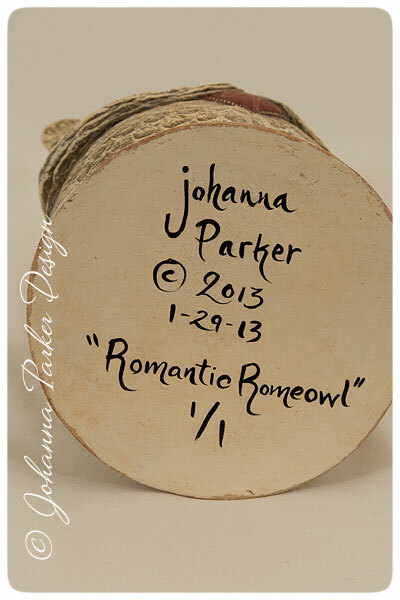 If you would like a chance at adopting "Romantic Romeowl,"simply EMAIL ME with your Best Offer. What would you (or your honey) be willing to spend in order to adopt this collectible piece? On Thursday, February 7th at 9:30 pm EST, I will email all the participating bidders with a Last Call, announcing the current high offer. Afterwards, bidders will have until mid-day on February 8th to submit any additional offers. I hope to announce the Winning Offer amount here on my blog by 11am MST on the 8th. So, you have about a week's time to submit your best offer/s. Anyone has a chance to participate if he or she chooses, and bidders can keep track of the approximated offers here on my blog. Please study the various photos below to see if you would like to adopt "Romantic Romeowl." If he hoots to you, then . . . . . . .
* Title your email: "Best Offer - $ ____ "
As you submit your offer/s, you are welcome to identify yourself or remain anonymous. Send emails from whatever email address you choose as long as I can reach you in the event you are the winner! I will be accepting offers until 11am MST, February 8th. At that time, I will review the offers and post the pending best offer amount. The winner will be notified and will have 24 hours to respond, identify him or herself and start the process of finalizing the sale. The piece will be offered to the bidder of the next best offer, in the event the top bidder does not to respond. * Who can resist this charming Valentine? * Oh, won't you be My Valentine?